Cattenstedt is a small village near Blankenburg in the beautiful Harz. Fields, meadows and forests invite you for a walk or for hiking. 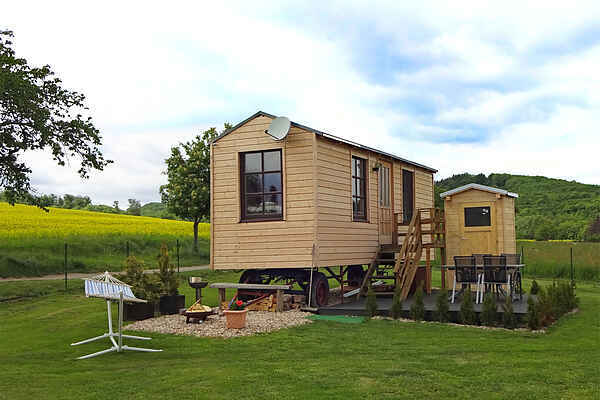 A unique vacation experience awaits you here in this completely equipped construction trailer. Your abode features a small kitchen with kitchen sink (with water connection), coffee maker, water boiler, toaster and refrigerator. A dining area, settee, as well as a TV and a CD radio are also available. The house can be heated with a cozy wood stove. The heated bathroom is located approximately 200 m away in a low-rise building on the premises. You'll have a wonderful view onto the nature and the fruit meadow from the detached construction trailer. In the outdoor area, there is a cosy sitting suite with garden furniture, fire bowl and barbecue. A playhouse ensures variety for the little guests. The region also offers the guest an extensive selection of sports and leisure opportunities. Numerous destinations and attractions can easily be reached, such as Wernigerode, Halberstadt, Quedlinburg, Thale Fairy Ring (Hexentanzplatz, Rosstrappe), Schierke, Rübeland (caves), Bodetal etc. Experience a small piece of freedom and adventure in this unique and \"small but nice\" holiday home!